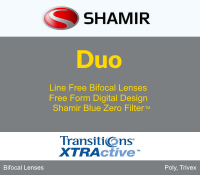 If you cannot adjust to wearing progressive lenses and hate lined bifocals we have the lens for you! 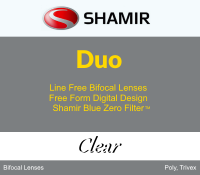 The Shamir Duo is a line free bifocal that provides clear, wide viewing areas for both distance and reading without the annoying "image jump" where the line would be. The lenses are clear and smooth from one visual field to the other. 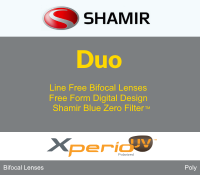 Also, Shamir Duo comes with Blue Zero in the lenses, a clear monomer, which filters 20% of HEV blue light. Rx must include your name, exam date, Dr's name. 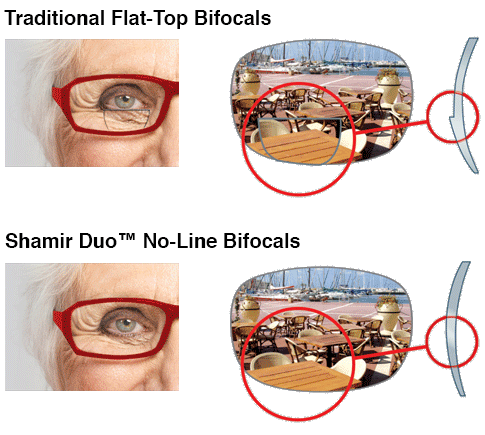 Rx must include your Distance prescription and the Add Power for multifocals. Find a frame. * The frame should have a height measurement of at least 30mm. Slim frames will not work. Add the frame to your cart without any lens types or lens options selected. Just the frame. Come back to this page and select the lens you want below by clicking on the Shop Now button. On the lens page you can select the options you want and upload your prescription and PD. Lens Color: Polarized in various colors.